So, you consumed the optimal pre-workout meal, drank a pre-workout supplement with an effective formula, and absolutely killed your workout. Now what? This is the question I get more than any other: "What should I be doing post-workout?" The oversimplified answer: Consume the proper macronutrients and supplements to replenish the energy you used, repair the muscle tissue you broke down, and increase muscle protein synthesis. Let's dive into each of the three aforementioned things your post-workout supplementation and nutrition should be doing for you! During intense exercise, your body uses a long string of glucose molecules called glycogen to fuel your body with energy. When your body uses this glycogen, it depletes its natural stores, which are located primarily in the skeletal muscle tissue and the liver. How much is depleted, you might ask? Research on glycogen usage and depletion has shown that up to 40 percent of your glycogen stores can be depleted during one bout of intense training! So, now that you know just how glycogen-depleted your muscle tissue can become, let's talk about the best way to replenish the glycogen used during your training session. In order to replenish your glycogen stores after training, you should consume fast-digesting, high-glycemic carbs immediately after training: I recommend PowerCarb Karbolyn or dextrose. I'm not a fan of fructose (fruit sugar) because it actually has a low glycemic index and doesn't give the insulin spike I look for post-workout. Simple carbohydrates, like the ones listed above, are not ideal at any other part of the day, due to the fact that they digest so quickly and cause an insulin spike. Research on glycogen usage and depletion has shown that up to 40 percent of your glycogen stores can be depleted during one bout of intense training! However, those exact qualities make it ideal for post-workout nutrition! Simple carbohydrates require minimal digestion before your body can absorb them, providing you with the fastest possible replenishment of your muscles glycogen stores and the large insulin spike. Why is the insulin spike important? Insulin, which is one of the most anabolic hormones in the body, regulates your blood sugar by shuttling nutrients (glucose) to muscles with depleted glycogen stores. Once all muscles are saturated, your body stores the remaining glucose as fat. So, while insulin spikes during times of the day other than training can lead to unwanted fat gain, the same spike post-workout can actually jump-start your growth and recovery. This ensures that your muscles' glycogen stores are replenished, and that your body is primed and ready for its next training session. If you read my previous article on pre-workout nutrition and supplementation, you know I am a big proponent of consuming about 50 percent of your daily carbohydrate intake in your pre-workout meal and your post-workout shake. So, if you consume 300 grams of carbs daily, you'll consume 150 of them before and after training. 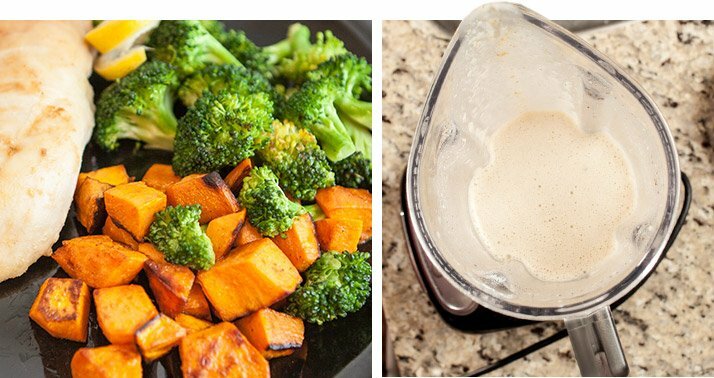 Split the 50 percent between your pre-workout meal and post-workout shake to be about even. If you feel you don't have enough energy while you're training, consume more of those carbs pre-workout—say 30 percent—and then consume the remaining 20 percent in your post-workout shake. Alternately, if you have plenty of energy and a good pump while you train, but are dragging and feel flat—a key indicator of glycogen depletion—after your session, it might be beneficial to consume a larger portion after you train. Once again, I'd say up to 30 percent. Personally, I have always had great experience splitting them right down the middle, doing 25 percent of my daily carb intake before I train, and 25 percent after. I am a big proponent of consuming about 50 percent of your daily carbohydrate intake in your pre-workout meal and your post-workout shake. When you train intensely, you cause very small tears, or microtraumas, to your muscle tissue. These microtraumas cause the muscle trained to feel sore during the days following. It is when your body repairs this microtrauma that you gain an increase in muscle size and strength. There are ways you can help mitigate this breakdown immediately following training to get a jumpstart on recovery. Whey is the quickest-digesting protein. It's amino-acid profile is high in BCAAs. Whey contains little to no fat. Eating whole food immediately post-workout can be a challenge, and takes longer than drinking a shake. Whey protein is extremely rich in the nutrients needed to repair and rebuild muscle. By consuming it post-workout, rest assured knowing that you have given your muscles exactly what they need to repair the damage caused by your training session. How much whey protein should you consume after a hard training session? Opinions vary on this matter, but I recommend consuming 20 percent of your body weight in grams of protein. To find how much you should be consuming, simply multiply your body weight in pounds by 0.2. For example, I weigh 240 pounds, so I would consume 48 grams of whey protein (240 x 0.2 = 48) if I follow my recommendation, which is perfect for someone my size. Alternatively, if you're a 120-pound woman, you would consume 24 grams of whey protein (120 x 0.2 = 24) immediately after training. Glutamine is another ingredient that may aid recovery and help repair the damage caused by your training. Glutamine is an amino acid that may benefit you in two areas: immune function and carbohydrate uptake. When you train intensely, your body's circulating levels (plasma levels) of glutamine decrease due to the demand from your liver, kidneys, intestinal pathway, and immune system exceeding the supply present in your muscles and available from your pre-workout meal.1 By supplementing with glutamine, you can help replace these stores of glutamine, and subsequently help your immune system and other systems that rely on glutamine to function optimally. Having a stronger immune system is a critical benefit of glutamine, since coming down with some kind of sickness that keeps you from training and eating can hurt your progress. The most important supplement, in my opinion, to take post-workout is a quality whey protein. In addition to supporting and optimizing immune function, supplementing with glutamine may be able to increase whole-body carbohydrate storage and muscle glycogen resynthesis. One study found that "whole body non-oxidative glucose disposal was increased by 25 percent after consumption of glutamine in addition to the glucose polymer. "2 Put simply, the addition of glutamine to the simple carbohydrates and whey protein will further increase your body's ability to shuttle nutrients to your muscles, which in turn will lead to faster recovery and better results. To fully reap the benefits, consume at least 5 grams of glutamine immediately following training, and another 5 grams at one other time during the day. Fast, Medium And Slow Release Proteins For All-Day Lean Muscle Support! Go Now! Armed with that knowledge, you can begin to see the one thing you haven't gotten in adequate amounts from your simple carbohydrates, whey protein shake, and intense training session: branched-chain amino acids. The third—and perhaps the most important—thing your post-workout nutrition and supplementation should do is increase your body's muscle protein synthesis (MPS). While whey protein has a solid amino-acid profile for repairing muscle tissue, it does not contain enough leucine to adequately stimulate the mTOR. This is where BCAAs come into play. BCAAs have a high concentration of the amino acid leucine, which, as previously mentioned, is a critical stimulator of the mTOR pathway, and subsequently MPS. Most BCAA supplements provide the BCAAs in a 2:1:1 ratio of leucine to valine to isoleucine, so in order to get the 3.5 grams of leucine that research suggests leads to the maximum activation of the mTOR pathway, you should consume 7 grams of BCAAs immediately post-workout (if they are 2:1:1 ratio). Make sure you purchase a BCAA product that contains fermented amino acids. Fermented BCAAs are superior to normal BCAAs because they're synthesized from cultures in a lab. This ensures there's nothing but quality BCAAs in the supplement. The other process, used by suppliers not yet offering fermented BCAAs, is the acid washing of organic matter such as duck feathers and animal hair to strip the amino acids. By consuming the proper amount and type of carbs, protein, and supplements, you can ensure that you've done everything possible to replenish the energy you used during your training, repair the muscle tissue you broke down, and increase muscle protein synthesis. All of these things should lead to increased muscle growth, strength, and recovery. As always, if you have any questions regarding this article, please do not hesitate to leave a comment, or send me a message if you'd rather keep it private. If you haven't been supplementing in this manner following your workouts, definitely give it a try, as I can guarantee the results will speak for themselves! The Most Trusted Name In Sports Nutrition! 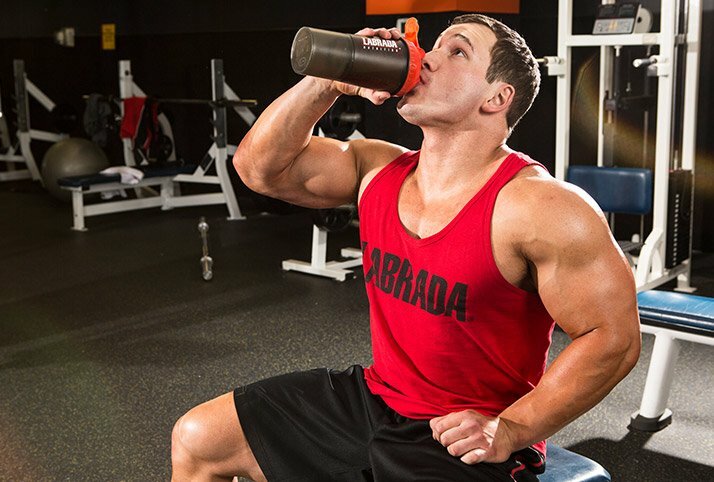 Check out Labrada Nutrition's complete supplement lineup! Go Now! Calder, P. C., & Yaqoob, P. (1999). Glutamine and the immune system. Amino acids, 17(3), 227-241. Bowtell, J. L., Gelly, K., Jackman, M. L., Patel, A., Simeoni, M., & Rennie, M. J. (1999). Effect of oral glutamine on whole body carbohydrate storage during recovery from exhaustive exercise. Journal of Applied Physiology, 86(6), 1770-1777. Hunter Labrada, son of IFBB Mr. Universe Lee Labrada, is a bodybuilder on the rise and proudly helping build the family business!